Hundreds of lorries will rattle down the new Ras Al Khaimah truck road that is expected to open next year, but there will be no clue that they are thundering over the remains of 4,000-year-old tombs. Archaeologists are in the final days of a three-month rescue excavation of the Qarn Al Harf tombs built by prehistoric date farmers. Four megalithic, communal tombs are being excavated by archaeologists from the University of Durham in the UK and the Ras Al Khaimah Antiquities Department, ordered by the Ruler of RAK, Sheikh Saud bin Saqr. Three tombs will be destroyed by the 32-kilometre RAK Ring Road that will bypass the city to connect the quarries and factories of the north coast with the 311 motorway. The tombs date to the Wadi Suq period, from 2000 to 1600BC. Bone fragments, carnelian beads, seashell rings and stone vessels found within the ancient tombs will reveal the mysteries of the people who cultivated the palm gardens below the Hajjar mountains. One Shimal-type, single-chambered tomb is the largest of its type at 24 metres long. These ancient megastructures were built of boulders that weighed up to a tonne and were carved from the mountain with bronze tools. But to the untrained eye, the unearthed tombs appeared as gentle mounds on the acacia-dotted floodplain, covered by 80 centimetres of powdery soil. The excavated tombs are on a fertile plain between Wadi Naqab and Wadi Al Baih that contains at least 60 tombs, field systems and houses first discovered in 1988. Scores of such tombs are found at the base of the Hajjar mountains. To archaeologists, these valleys of death tell the story of life. The palm gardens have been continuously inhabited for 4,000 years. The tombs, about 600 metres away, were reused and plundered over millennia, so that the story of their builders remains a mystery. 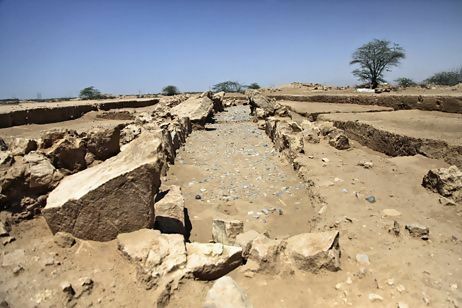 “People lived and lived and lived again, changed the earth, built new houses, dug the houses,” said Christian Velde, a resident archaeologist at the RAK Department of Antiquities. For this reason, it is difficult to know about the burial process, how many people were buried in each tomb or their religious beliefs. Families were together in death, as in life. A typical 12 to 14-metre Shimal tomb would hold 30 to 50 people. “Stillborn babies, small children up to very old people, male and female, everybody was buried in this tomb,” Mr Velde said. Life was nasty, brutish and short. Women had an average life expectancy of 25 years. Men lived, on average, to age 35. When the archaeologists return to the UK with the tombs’ treasures, it will take about 18 months to analyse the collection of stone beads, shell rings, metal earrings, pottery shards and stone vessels. It appears that every person was buried with at least one piece of pottery. Some were given beautiful stone vessels, decorated with lines and dotted circles typical of the Wadi Suq period. In Qarn Al Harf, archaeologists found a full arm with beads around the forearm and an earring next to a skull, evidence that people were buried wearing their ornaments. Few metal objects remain apart from the copper that made the region famous in the third millennium BC. Most metal objects were plundered. Each tomb was built on a foundation of stones with walls of huge limestone blocks covered by slabs more than a metre in length placed at an oblique angle. These tombs are 80cm underground. The Qarn Al Harf excavations include two, one-chamber Shimal tombs. The other tombs have three chambers, the first of their kind to be discovered. One of the tombs is unique in the country for its three connected chambers and will be beside the road and conserved.